Home » BJJ Etiquette » Is it OK to train at multiple BJJ gyms? Maybe, but usually not. It depends on each instructor, but it may be a sensitive topic to bring up. You could walk in to a minefield of old feuds and bad blood. Or you may luck out and have an instructor who is cool with it (but what about the teacher at the other gym?). Local schools are competing to attract students, and competing against each other in local grappling and MMA tournaments. This makes conflicts flair up quickly. Students with problems at one school may switch to a new one, and speak poorly of their old school and instructor, creating animosity between the schools. At the same time, his former teammates may be speaking poorly of him for switching schools. People want to feel they are at the gym they are at because it is the best, not because of random chance (like it being the only gym they checked out) or personal preference (like feeling more comfortable with the culture at one gym than another). An instructor at the other school may have originally been a student at the first, and split off on their own on unfriendly terms. Visitors from other schools may be treated as outsiders by instructors and students. Instructors may hold back techniques because they don’t want to give away the “secret sauce recipe” to their competitors. Students may take pride in trying to do better than a student from another school. This can be an unpleasant atmosphere for the visitor. When a new school opens up in an area, existing schools may lose students to it, and their old instructor may take it personally, even if the reasons for the switch were convenience (closer location), finance (cheaper rates), or personal preference (focus on sport, self defense, or MMA). Instructors are usually very proud of their school and how they teach, and with this pride can come being offended when they feel disrespected. Wanting a student to be loyal to one school doesn’t have to come from small-mindedness or insecurities though. To give an example, I knew a purple belt who would hop from gym to gym, usually just to drop-in. 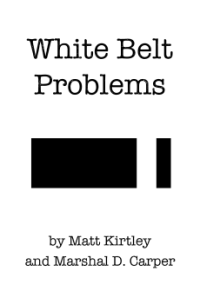 When a high level black belt opened a school in the area, he started dropping in there too. The black belt was friendly and let him join classes, but eventually asked him to pick his gym for good or not come back. The black belt said he wanted to feel that the time and effort he put into his students was staying invested in his own new school. The instructor was being honest about not feeling like he could give it his best if he didn’t feel like the student was fully committed. An instructor may have a clear vision for how to develop his students, and he doesn’t want another instructor’s teachings interfering. The counter-argument is that a student should be free to choose how and where they train. Instructors may find they’re having problems with skin infections (like ringworm and staph) and trace it back to cross-training with another gym with lower cleaning standards. Similarly, an instructor may find beginners are getting injured by dangerous moves that he doesn’t teach (like heelhooks and toeholds), and find they are being taught to people who cross-train at a gym with different rules. Brazilian Jiu-Jitsu culture has traditionally been against cross-training between schools. Phrases like “loyalty is law” and “no creonte” (creonte is slang for “traitor”) are common in old school BJJ. Many schools have an “us vs them, us vs the enemy” attitude. This can be seen as an extension of Brazilian and Latin American culture. The American approach has been more business-like. If someone wanted to have memberships at LA Fitness and Gold’s Gym, no one would care. Some people take that attitude towards BJJ gyms. This is at conflict with the older Brazilian mindset. A modern attitude is emerging where cross-training between gyms and freely sharing knowledge and techniques is acceptable and even encouraged. We are seeing more high level black belts training with each other, regardless of association. We are also seeing it more because as BJJ schools are growing bigger and adopting more professional business practices, instructors are becoming less personally offended if a student wants to try out other schools or even switch schools, especially if an instructor is confident they are providing a quality service.